Nepenthes mikeii is a relatively new species to hit the market. 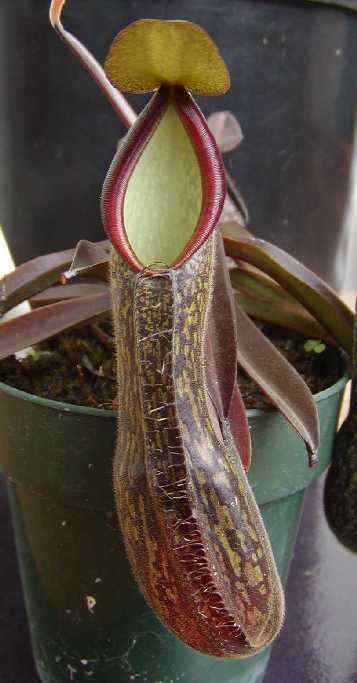 This plant is also featured in Clarke's book "Nepenthes of Sumatra". That's pretty much where I became familiar with this species. What I like is that the leaves are a dark green almost maroon and the pitchers are very dark with striations. It's not completely dark brown like N. ramispina, but a little greener. I also like the maroonish peristome and creamy interior. It appears to be a faster grower than most highlanders. Also, when this plant was first available, it had about a 4-5" leaf span. In other words, it wasn't a small size 2 or size 3. I've found that it is an easy going species that is worth getting because of its unique coloration and ease of cultivation. Once N. mikeii gets into the vining stage, it's a pretty quick gower. This is the only specimen I grow, but I would consider a nice "step up to" species after N. ventricosa and N. alata for example for anyone trying to grow outdoor.